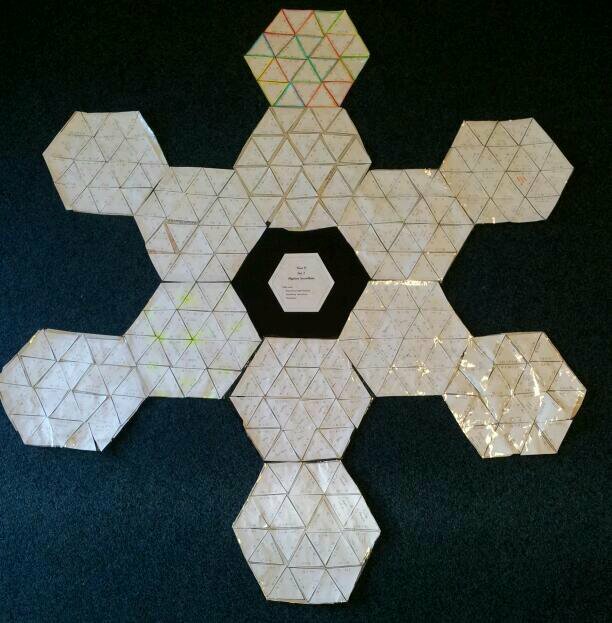 We used a hexagonal Tarsia puzzle on expanding single brackets to create large hexagons. The puzzles were stuck on paper, cut out and the edges reinforced with tape. Twelve hexagons make a splendid snowflake. Once it was stuck together, the wall display was as tall as a Y7 pupil. Just think what you could do with Tarsia puzzle shapes: snowflakes from hexagons, christmas trees from triangles and bunting from dominoes. If you want more puzzles, visit Mr Barton Maths for a plethora of resources. This entry was posted in General, Links, Problem Solving, Seasonal and tagged Christmas, puzzle, Tarsia, tessellation, wall display on 04/12/2013 by MsKMP.